Our machine the PRO EDGE has a C-shaped arm with a 180-degree rack. An electrospindle rides along this arm and a hydraulic motor and pinion drive along the rack. The machine grinds and polishes the edge of a granite countertops. The rack and pinion are open and will get splashed with water and stone slurry. Recently we have been using a motorcycle chain wax lubricant on the rack and pinion. Prior lubrication was either wiping down with an oily rag soaked in way oil or spraying with "Aero-Lube" a lightweight oil. After a few years the pinion will wear with a "combing" effect on the teeth. Narrow, closely spaced deep grooves from root to tip on the tooth. It is believed to be caused from grit sticking to the rack and wearing the pinion. I think it looks more like advanced scuffing due to a lack of lubrication. 1.) Has anyone experienced this type of pinion wear? 2.) 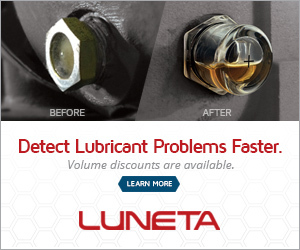 What would you recommend for a lubricant? It's probably both that are causing the problem. Lack of lubrication and contamination from stone dust/grit. There's no doubt in my mind that the contamination is causing some if not a large portion of the wear. I would recommend something like TRC's Takilube. It is designed for lubrication of ring and pinion gear sets as are found on large excavators which are exposed to high levels of dirt/dust contamination. Agree with Michael. Also you could use a good anti seize paste. The same type as used for very high temperature with a lot of solid lubricants like a copper or aluminum-graphite paste. I'd be a bit supprised if you could get a lubricant that would be thick enough to cusion the gearing from the abrasives, and most paste types will allow the hard particles to remain on the surface and cause additional wear. Remember that pinion is harder than the rack therby allowing the hard particles to embed themselves in the rack and preferentially wear the easily replacable (and cheaper) pinion.